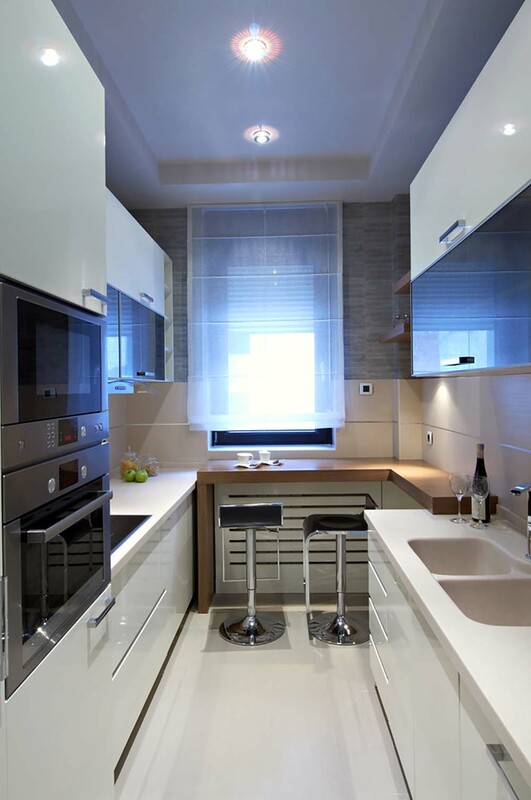 Small kitchen layouts are handy for smaller houses, condominiums and apartments. Although space is limited, design sensibilities are limitless. 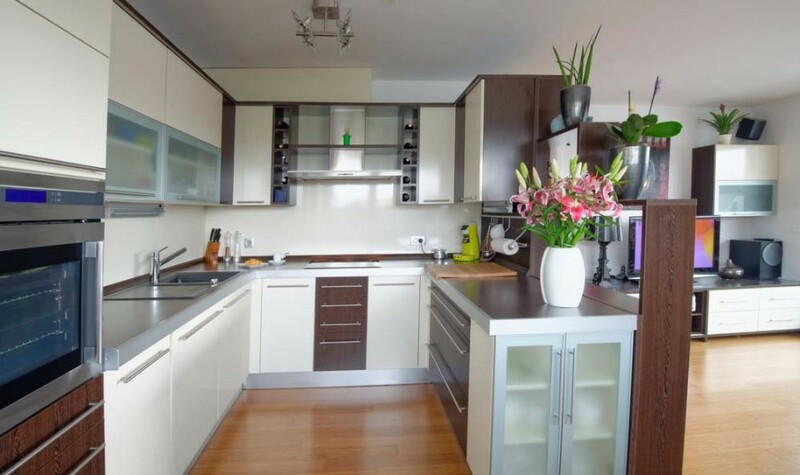 This collection shows both small and medium sized kitchens with unique takes on optimizing space. 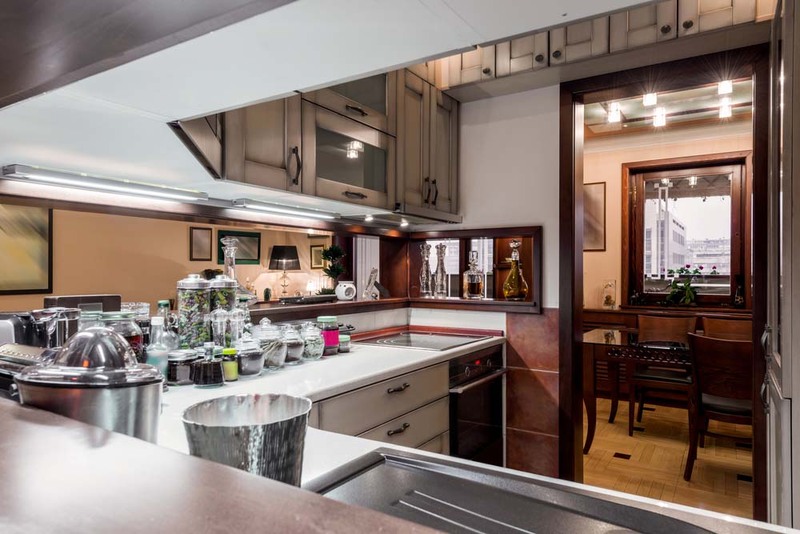 Some of the kitchens featured in this gallery present ingenious ways of combining architectural layout and custom-fit equipment. It goes to show that function comes first when designing the floor plan. A smart way of expanding space is by use of light colors and eye-catching lines. Don’t forget to personalize by adding vibrant touches on the wall paint, backsplash, lighting, and accessories. Small kitchens call for a lot of organizing. 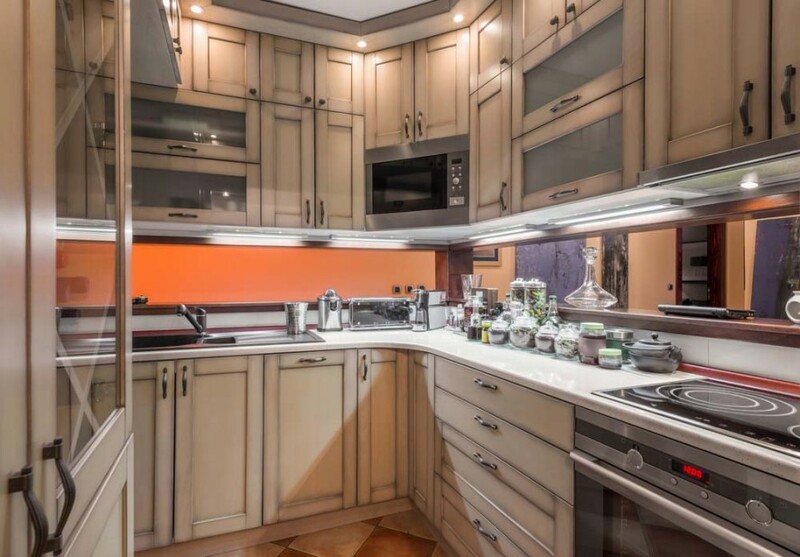 This nifty little number is maximized by custom fitting cabinetry, a multi-functional stainless steel sink and an amply sized dining set. The light and medium wood tones harmonize perfectly with the neutral walls and floors, while the green backsplash adds life. 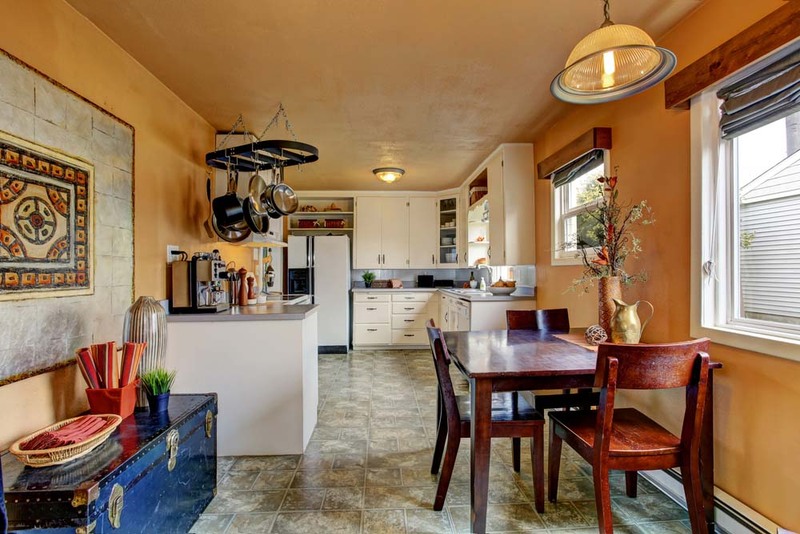 The battle of the sexes is charmingly alive in this medium sized kitchen and dining space. 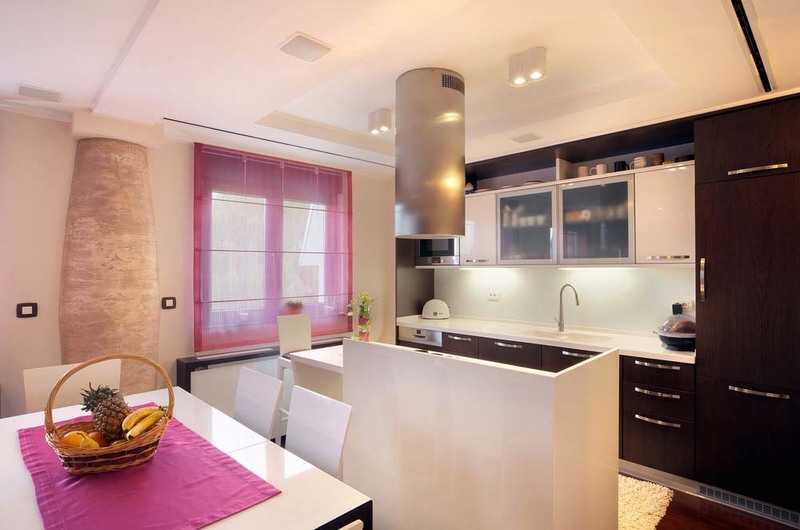 Chocolate colored and fitted with chrome, the masculine cabinets are complemented well by flirty hot pink. 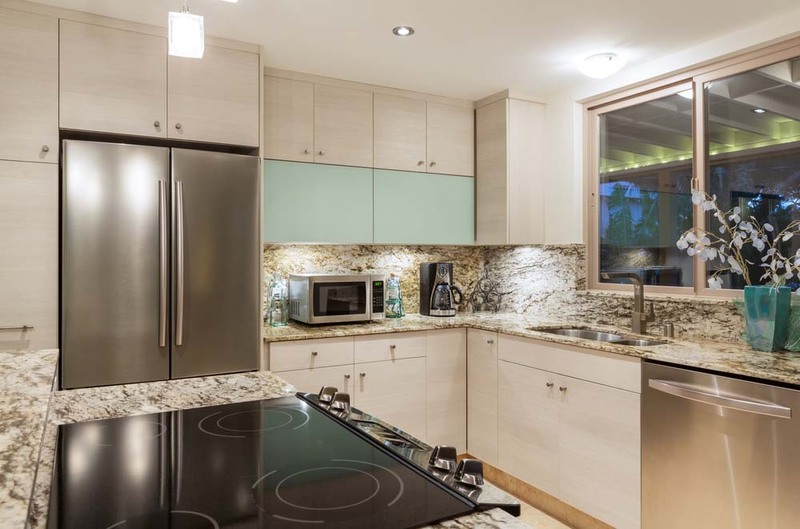 The key is to keep everything neutral, as in the white counter tops, island set and furniture. A cool trick with white kitchens is using a variety of tones on different surfaces,mixing ivory and eggshell with pure white. Not only does the palette create an illusion of a bigger space, it also adds dimension. Of course, it doesn’t hurt to add in some black granite countertops to make everything even sleeker. The same black and (shades of) white theme rolls onto the dining area. Tiny but interesting fixtures and art pieces fit well in a small space like this, where natural light is put to good use. 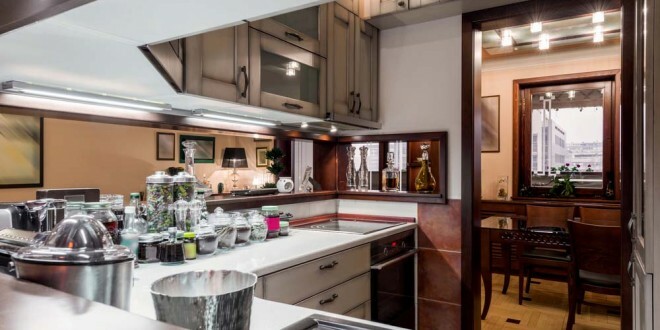 The star in this kitchen is definitely the chic chestnut motif seen on the cupboards, backsplash and breakfast bar. The horizontal lines make the room appear wider than it actually is, and the spare use of accessories such as the clock and light fixture seal in uniqueness. 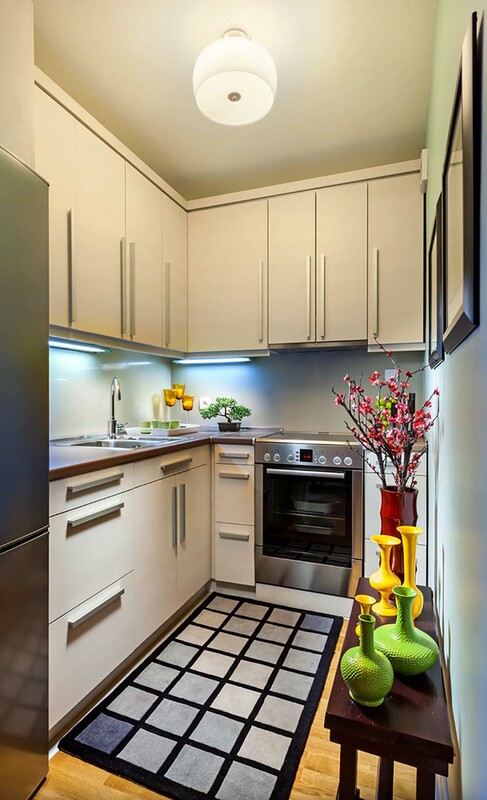 The steel gray paint beautifully camouflages the shiny steel refrigerator in this well-maximized tiny kitchen. The room makes fine use of both organic and industrial elements in the mix of metals and wood tones. 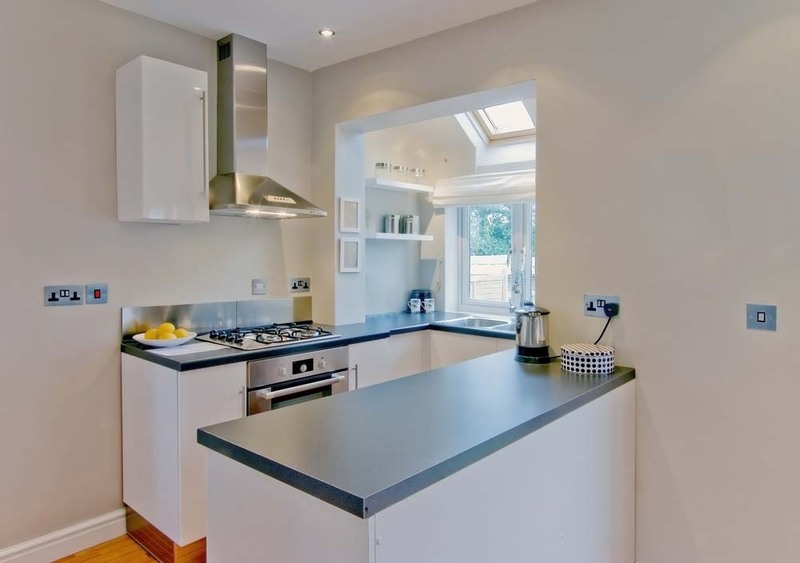 This kitchen may be small in size, but it’s big in design. 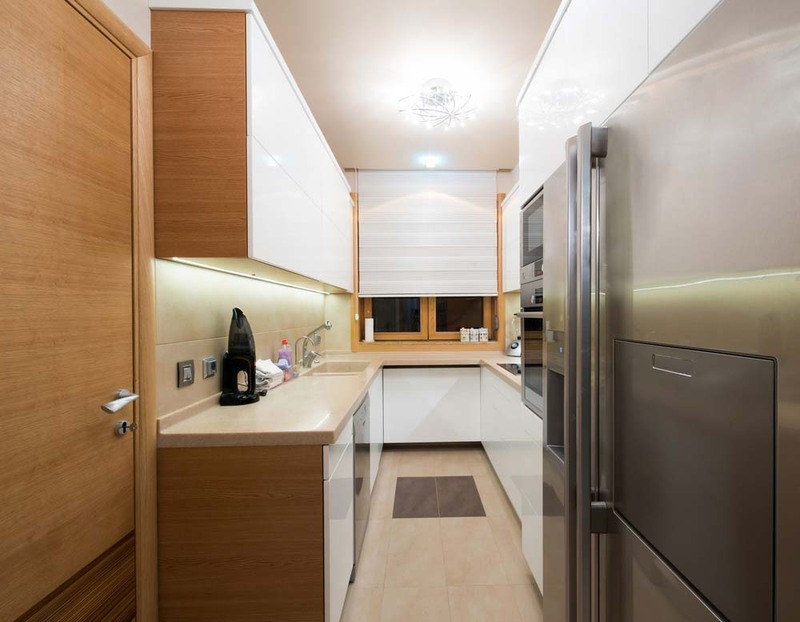 The modern lines of the cabinets, cupboards and carpet mesh well with the exciting colors and shapes of the accessories, with the background of cream and caramel. 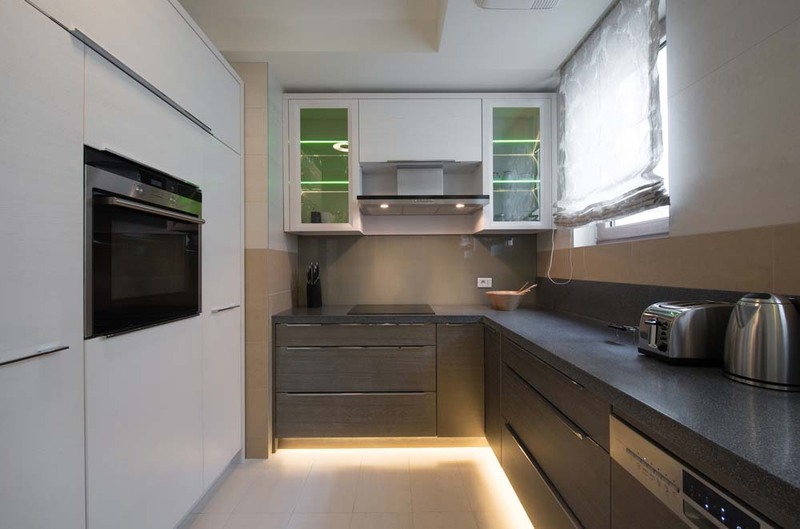 The light taupe motif in this medium-sized kitchen works perfectly with the sensual lighting. 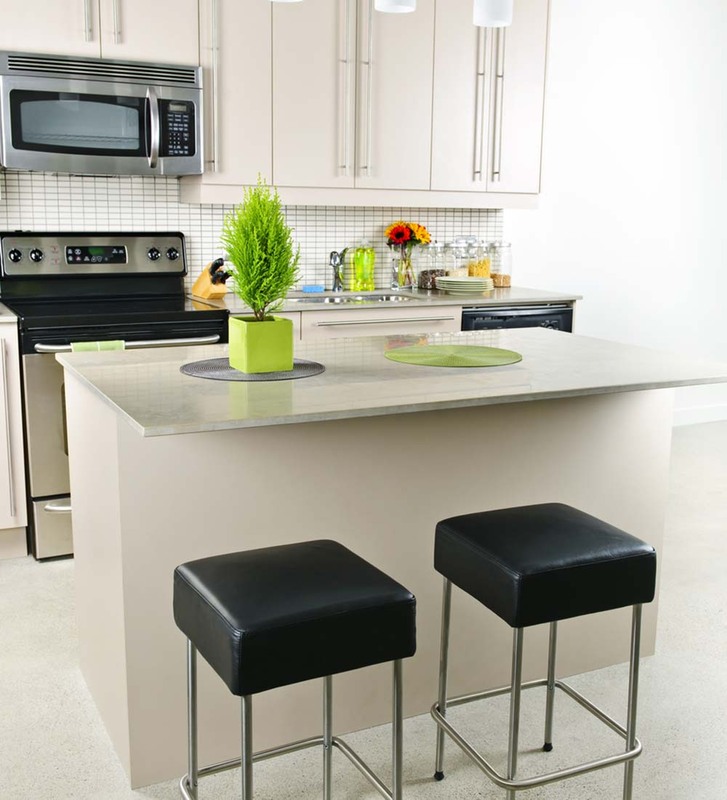 Dark granite countertops, interesting island details, and a colorful pop art sitting area complete the look. 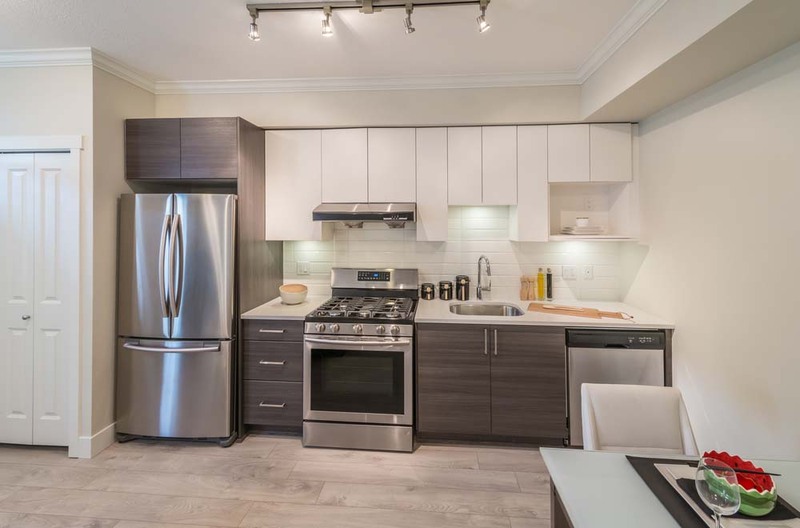 Small cooking and eat-in counter in heavenly shades of white, stainless steel appliances and an industrial pipe behind ceiling lights. Wide glass doors expand the space next to a cozy nook. 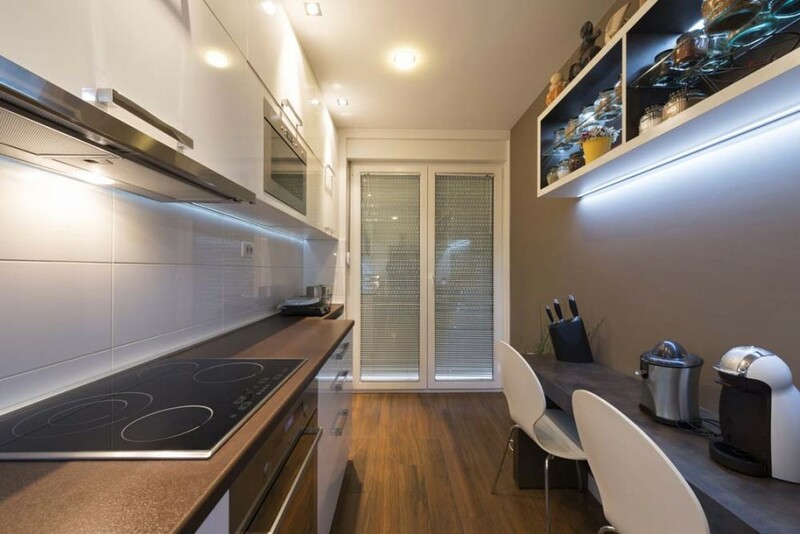 This urban micro apartment calls for a savvy layout incorporating the living, dining and kitchen area. 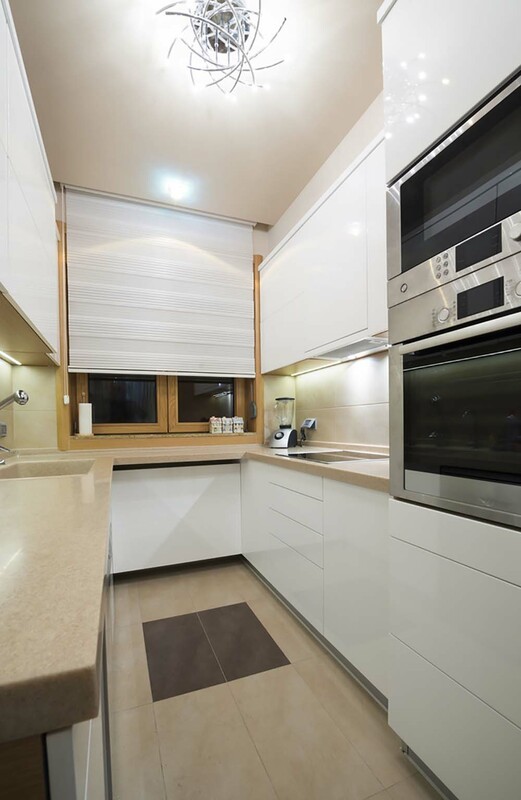 Custom white cabinets, the right sized furniture, light wood floor, and warm shades of almond tie the space together. 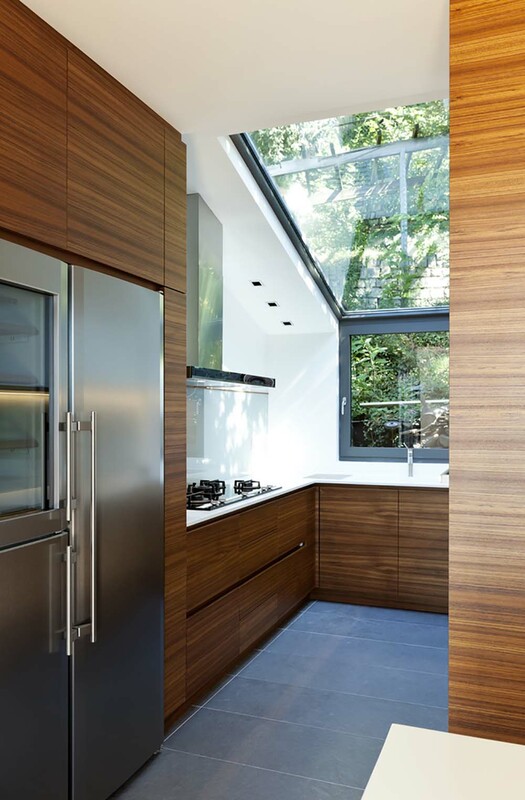 This galley kitchen bathes in light coming from the huge glass window of the slanted ceiling, perfect for the narrow space. White cupboards and cabinets are all lined up to the side, while black countertops and wood floors add contrast to the otherwise all-white theme. There’s a lot to do in this small area, and it is packed with huge style. It makes beautiful use of space with an eat-in counter at the end, and two storage areas on either side, both topped with sinks. 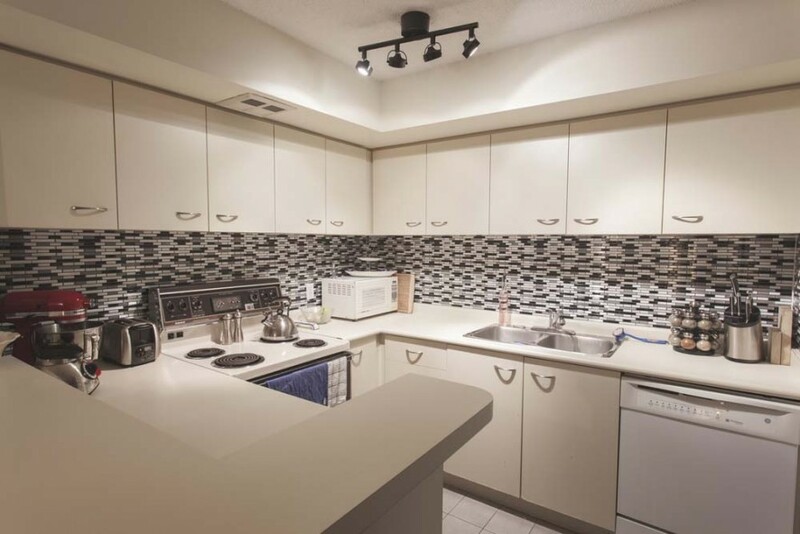 The floor, tray ceiling and majority of the custom cabinets are white, complemented with black cabinet doors, and a combination of slate and cream tiling. Limited horizontal space calls for maximized vertical layouts, like this beautifully practical kitchen. 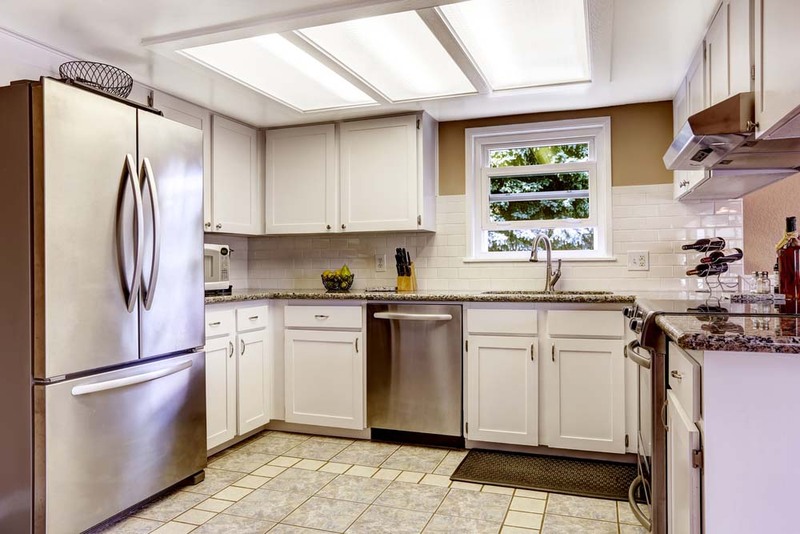 There’s plenty of storage available in cabinets outfitted in white, dark wood, and glass. This tiny space highlights how backsplash color can enhance kitchen design. 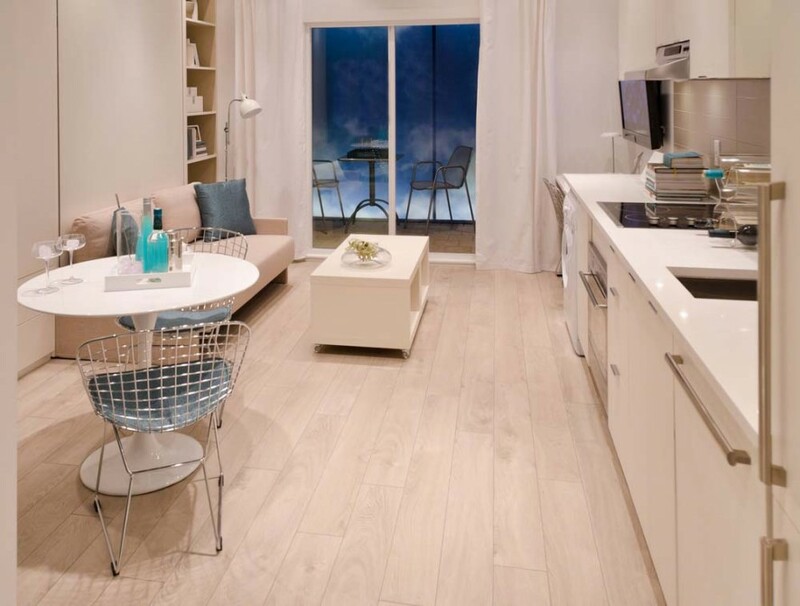 The bright aqua shade stands out amidst natural wood and light colored marble floors. 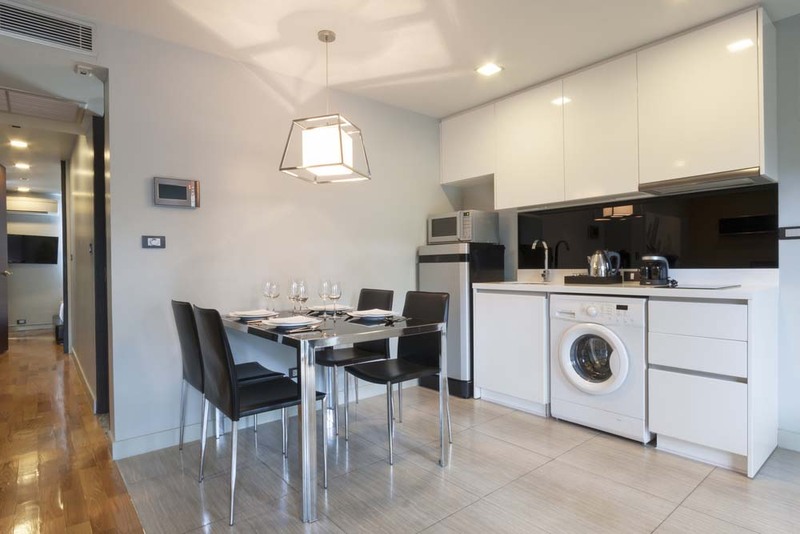 This modern kitchen-dining area also shares its space with a washer. 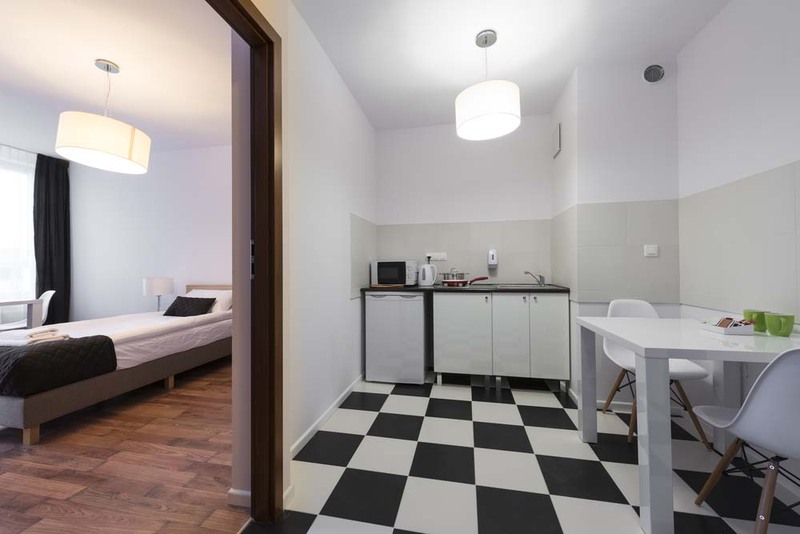 The black and white palette is paired with large cool toned floor tiles. Stainless steel serves as an industrial accent on the dining set and the contemporary ceiling lamp. 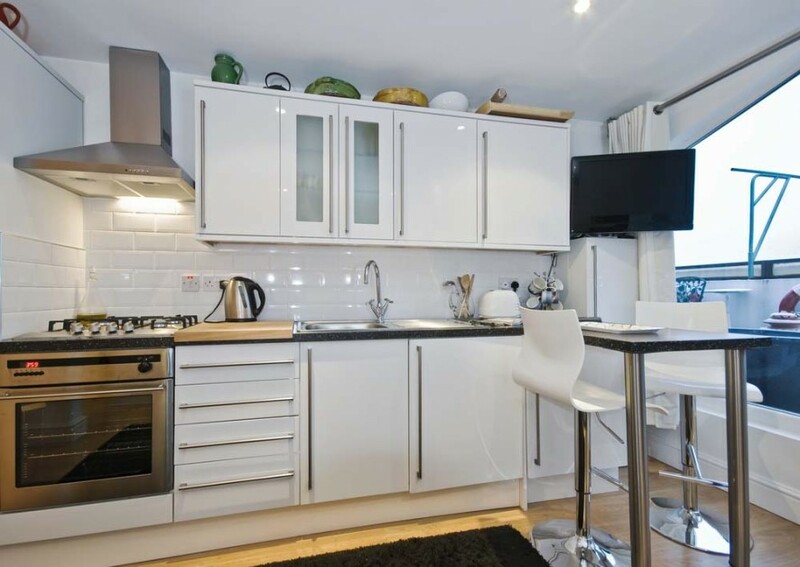 Another shared space with white specked counter tops, white cabinets and a compact white dining table. The warm tones of the floor are reflected in the backsplash tile lining. 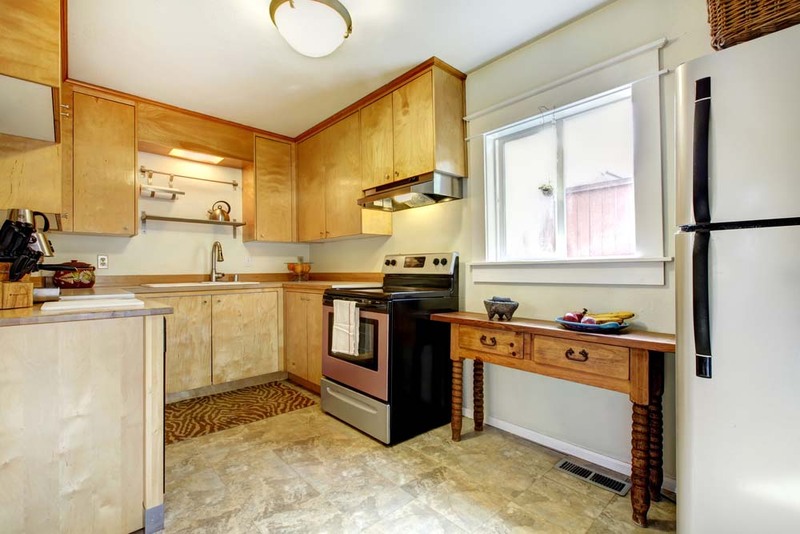 The tiniest kitchen of all features cabinets and floors all on one side, topped with small appliances. Touches of green matched with white walls and dark wood make for a crisp and clean area. A truly narrow modern pantry outfitted with an optimized wall for a sink, storage space and a spice tray. 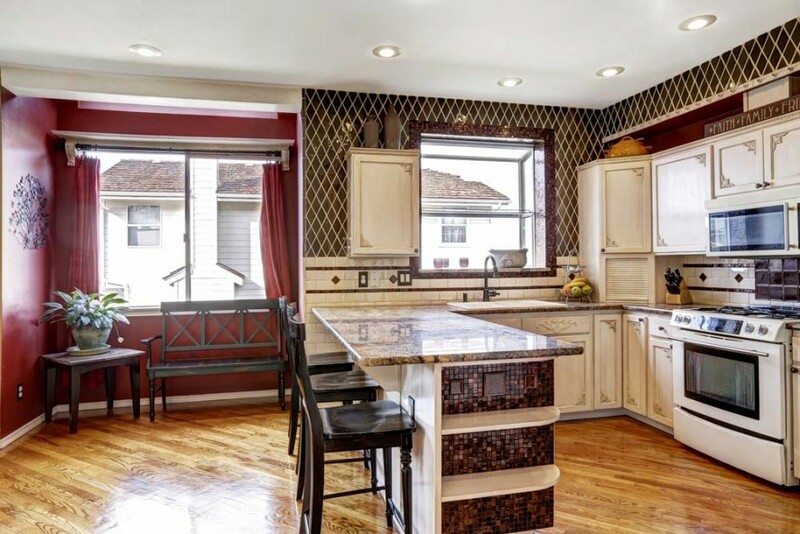 The shiny black floor and backsplash are flanked with the grid-like pattern of the wall tiles. 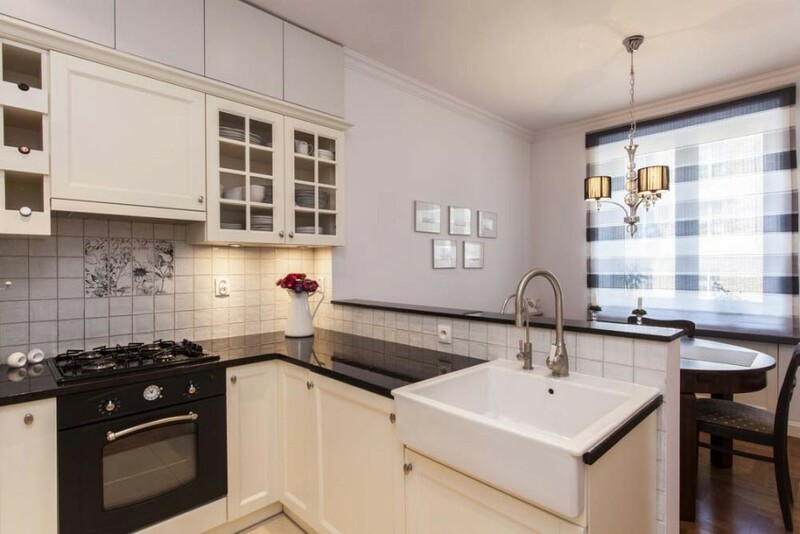 Small kitchen with custom built cabinets in white around the oven and over the sink. 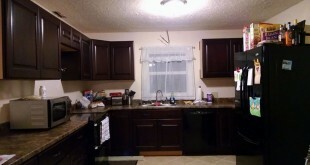 Another set of customized cabinets in slate gray with matching countertops also are featured. The flat surfaces of the compact storage areas in this narrow kitchen space give it a very contemporary vibe. The interesting tile arrangement on the floor matches the quirky ceiling light. 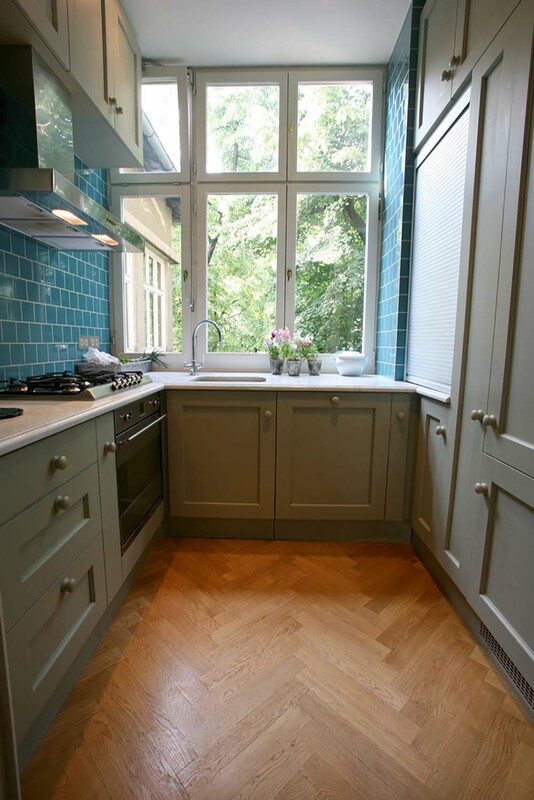 The deep blue tiling of this kitchen’s backsplash proves that a little color can go a long way. 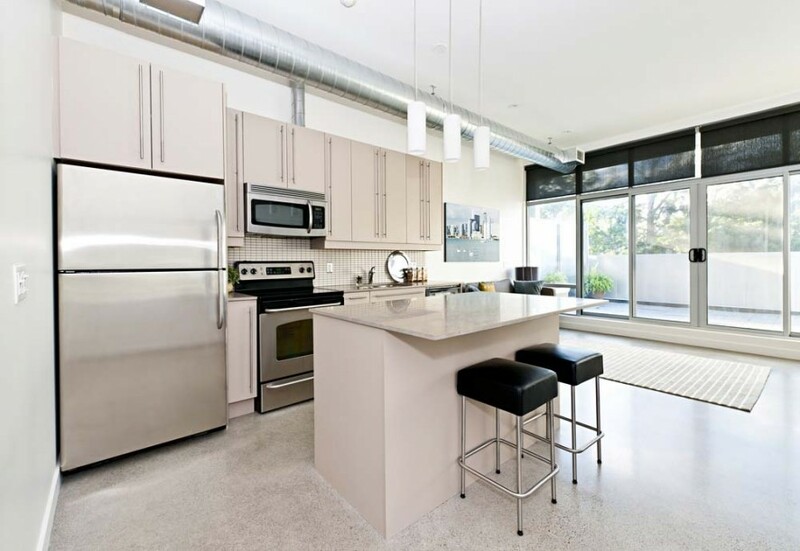 A mix of matte and glossy white dominate the area, with dark gray countertops stainless steel accessories. While this space is not exactly small, the organizing technique can definitely be applied to any small space. 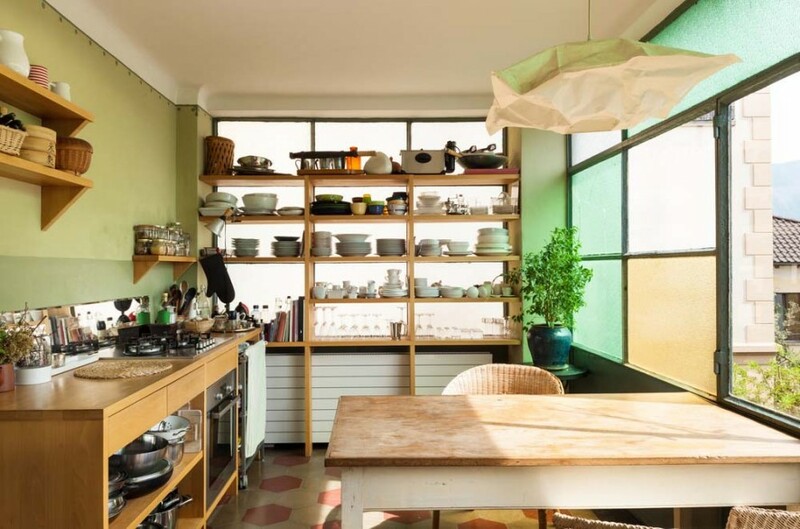 The open shelving maximizes vertical space and the compartmentalized cooking and dining areas work well. Plus, the shades of green pop in a sea of caramel and auburn. A blend of traditional and modern elements is shown in this kitchen. 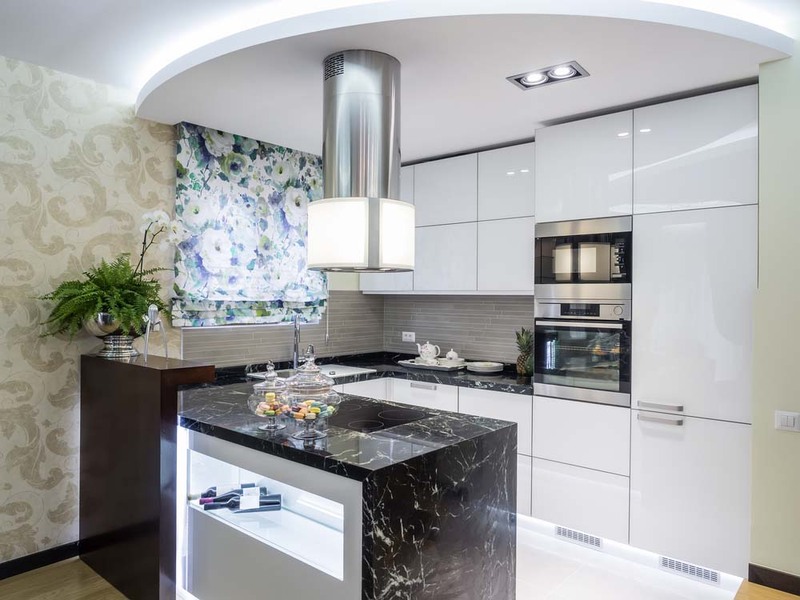 Marble is not only used on the floor, but also on the cabinets. Light wood tones on the cupboards and side table add a practical complement. 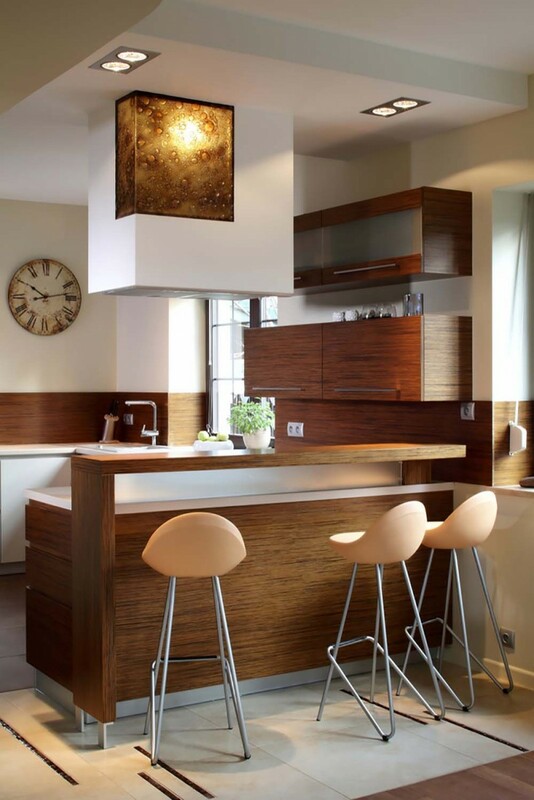 While most small spaces use light colors on a large scale, this bold kitchen makes use of dark shades to give it depth. 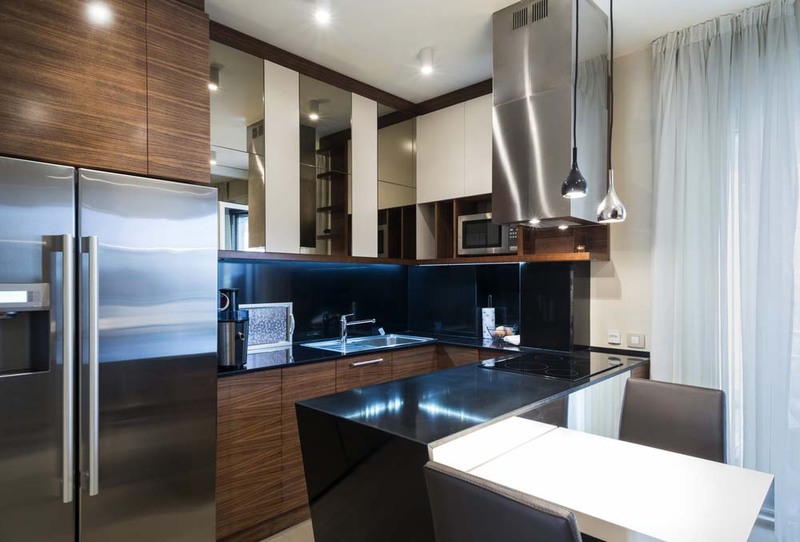 The black countertop extends to a peninsula, dividing the kitchen from the dining set for two. The color red induces appetite, no wonder it’s the daring choice for this luscious space. 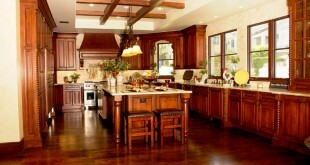 The cooking area to the right is decked in burgundy and intricately designed cabinets in cream. 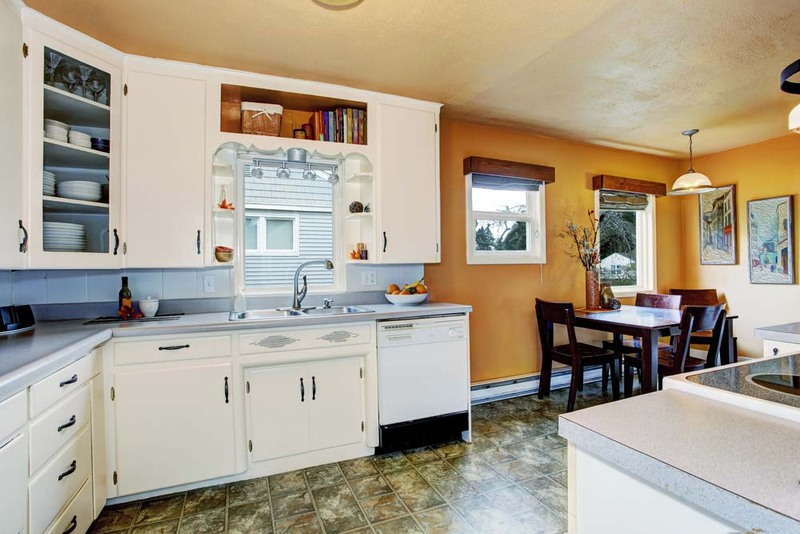 The brown countertop juts out to an eat-in island, serving as a divider from the sitting area to the left. Small kitchens call for custom-fit storage space and a multipurpose peninsula that also carries the sink. 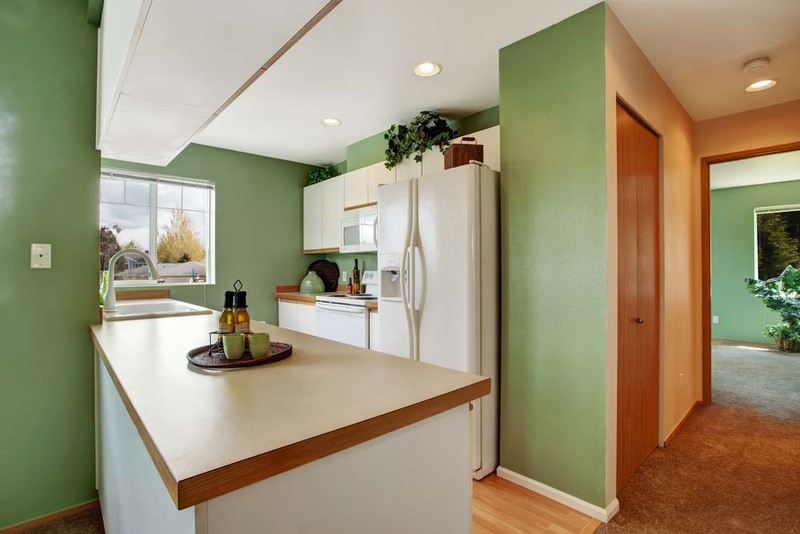 This particular space stands out with its white cabinets on fresh green walls. This compact medium-sized kitchen is decked in luxurious black cabinets and a mosaic of cool-toned gray and brown backsplash tiles. The black blinds blend well into the theme. 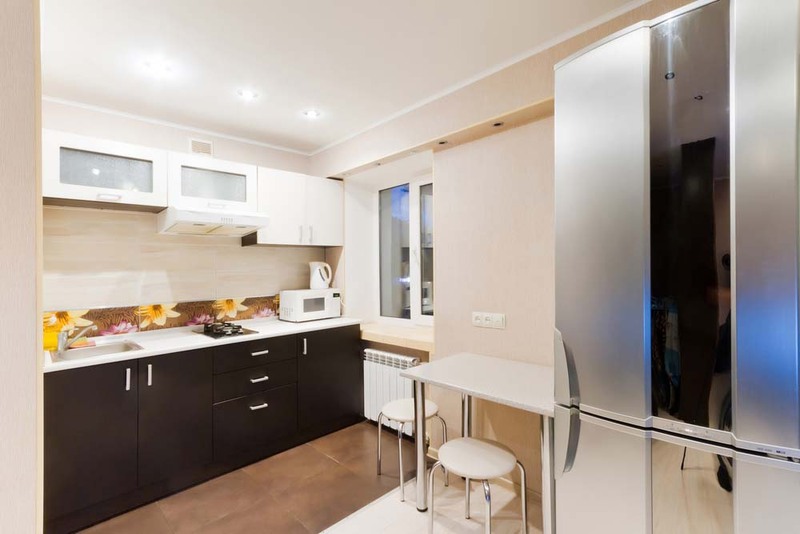 Another not-so-small kitchen which maximizes its space with modular storage on the walls and ceilings. 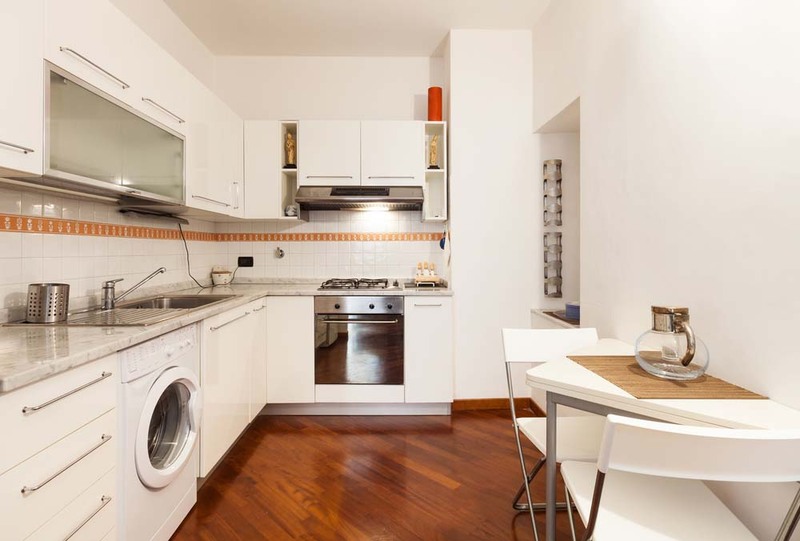 The area holds both the white-themed cooking and washing area and a red wood dining set, with a small l-shaped island serving as a divider. An eclectic mix of design elements come in the shape of a rich blue trunk and tile artwork. Marble’s natural patterns and colors become the focal point of this kitchen. 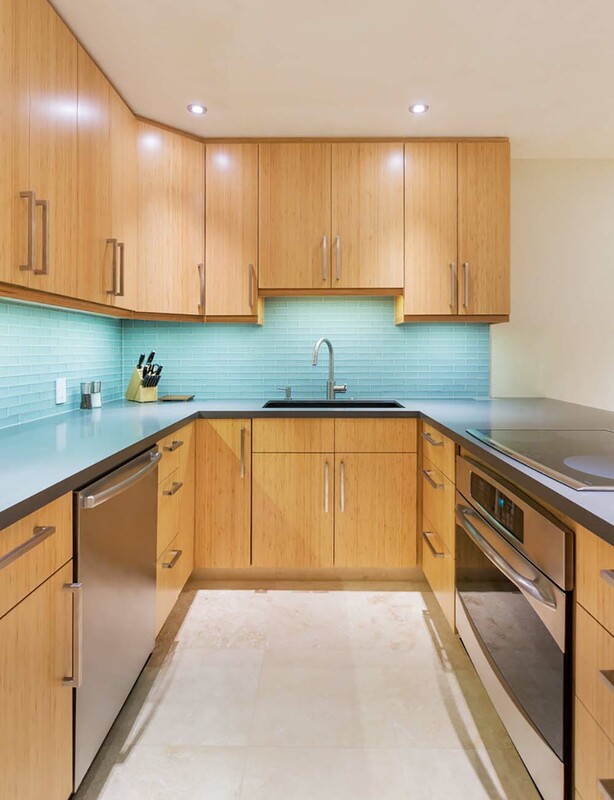 Inbuilt cabinets in beautiful bone, stainless steel appliances and a refreshing splash of mint green complete the ultra-chic contemporary look. 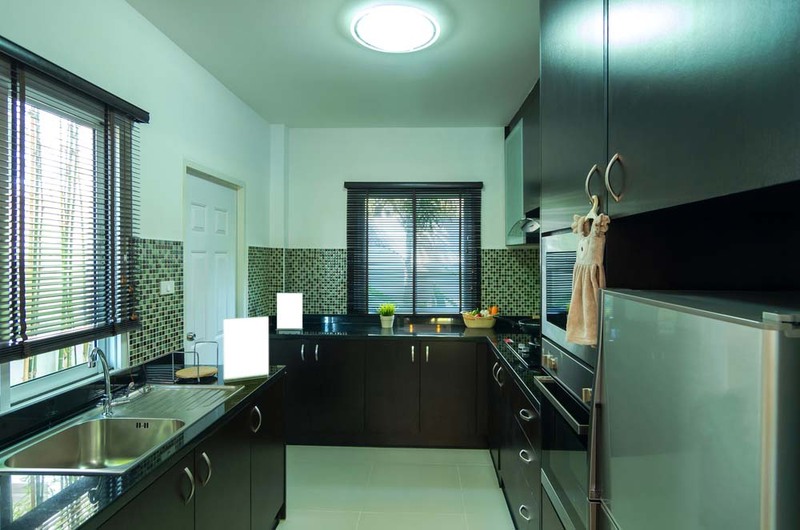 This medium sized kitchen features subtle variations of olive and brown amidst white cabinets and ceiling. The beautiful skylight is complemented by the tile floors of varying patterns and sizes. At the end of a narrow hallway is this unique cooking and dining area with taupe walls and light wood cabinets. Storage spaces are built around the appliances, optimizing the open layout. The deep brown wood is a nice break from the light grays and browns. 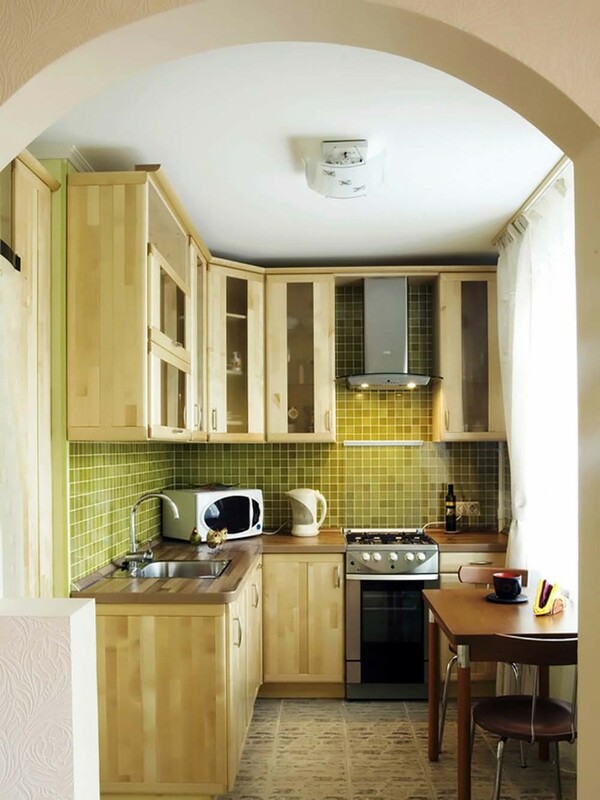 A unique take on organizing a small kitchen comes in the form of symmetry as seen here. The result is a beautifully optimized space, complete with a four-seat dining area. The focal point of this area is the ornately modern gray wallpaper which used on the wall and island facade. 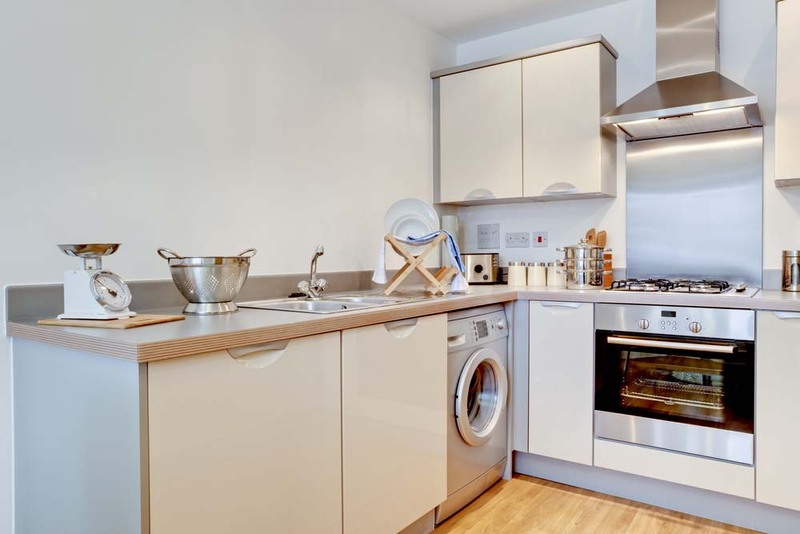 A mix of open and closed shelving flank the washing and cooking area, all compactly attached to one wall. The dark-stained island surface and green accents add color and dimension to the white and gray surroundings. 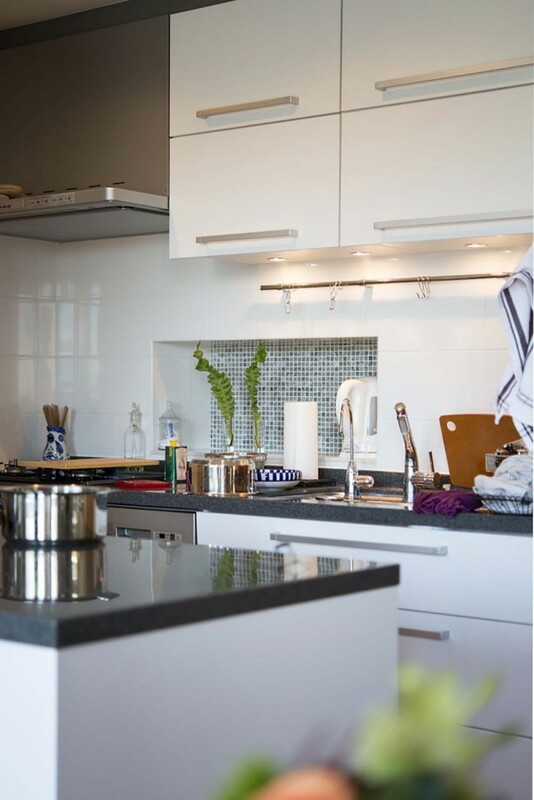 A creative arrangement of black, white and gray tiles as backsplash gives this kitchen some oomph. 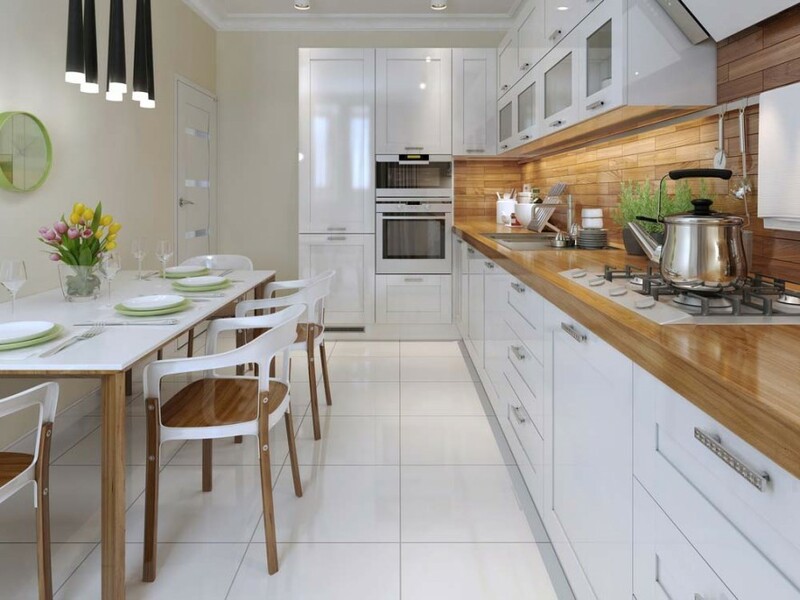 Ivory walls and plenty of cabinets complete the crisp, modern theme. 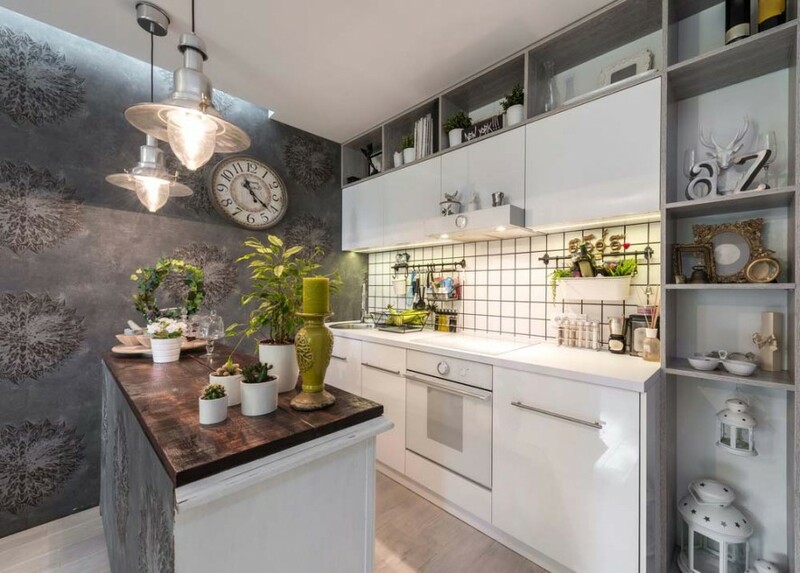 The gorgeously detailed hanging cabinets steal the show in this small kitchen with a unique semi-open walls. Accessories and fixtures in stainless steel create some contrast against the warm browns of the adjacent dining area. A different view of the same semi-open room is seen here, showing the matching top and bottom cabinet design. Simplicity is key when optimizing space. Varying shades of white and light neutrals create some dimension in this narrow kitchen, with a dining bar on one side and a cooktop on the other. A mix of colorful accessories serve as an accent space in the open shelves above the dining area. 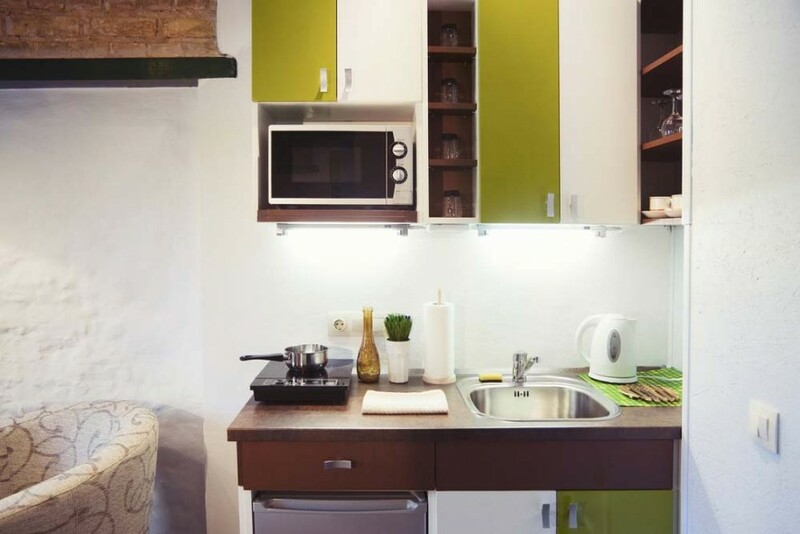 This small kitchen with an open layout makes use of a single wall for cooking, washing, and storage. 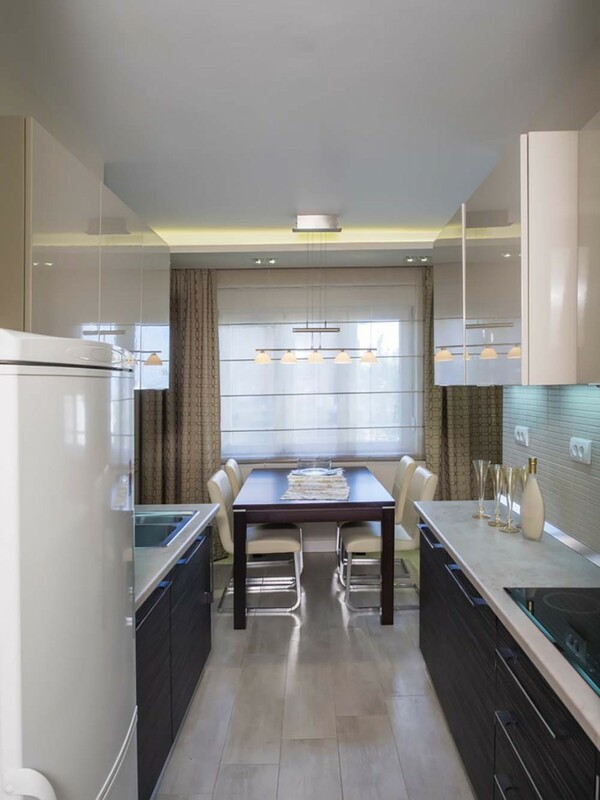 Cool browns accentuate the space, with light marble flooring and white overhead cupboards. How quirky is that floral backsplash?This cooking and dining space utilizes two perpendicular walls in shades of tan and white, with a touch of dark wood for depth. 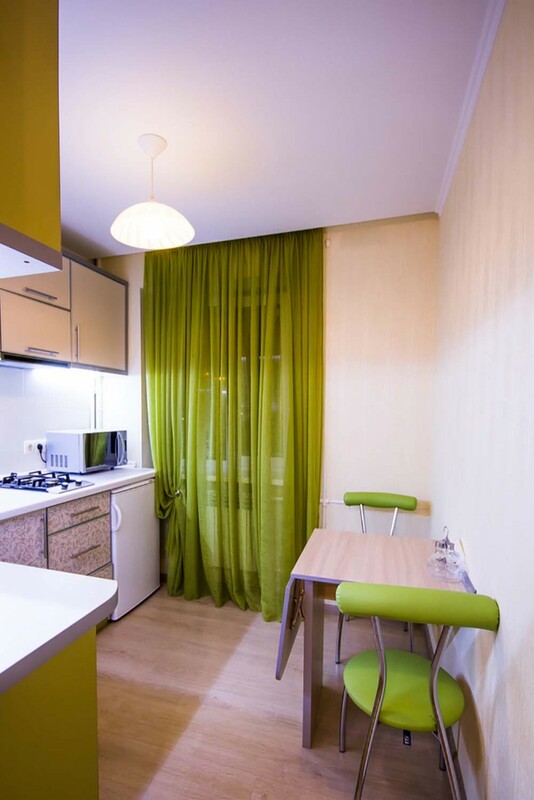 Clean green is the accent of choice in this small kitchen, complete with a two-seat dining area. The cabinets with interesting steel piping also add interest to the already unique space. 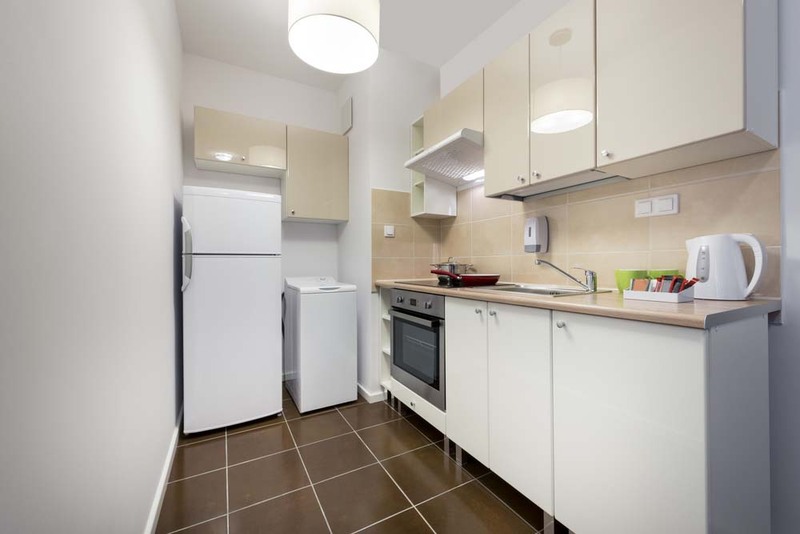 This apartment kitchen is openly accessible from both dining and living areas. 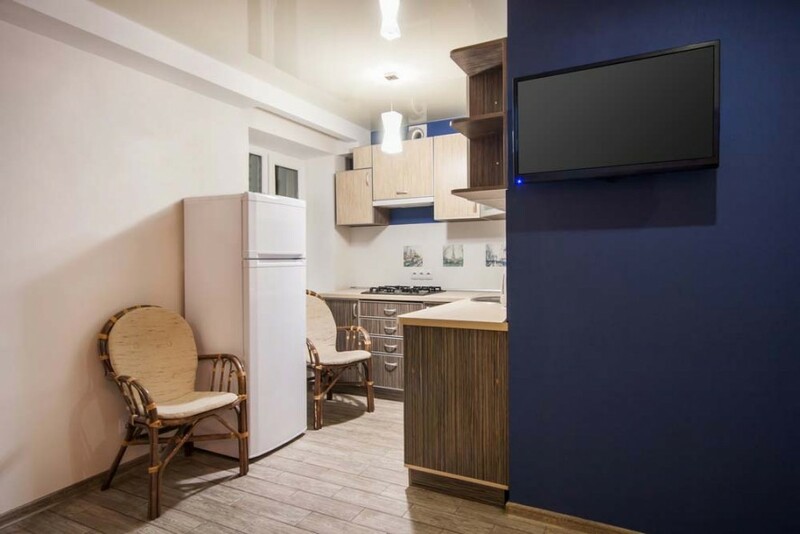 Bold blue accents some of the wall, while faux wood texture of varying tones is seen on the cabinets and the flooring. White and warm browns work in harmony as perfected in this kitchen and dining layout. 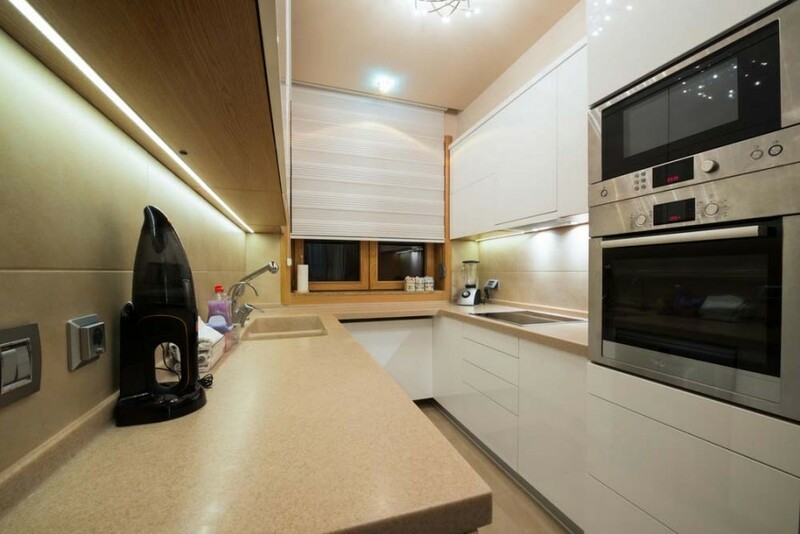 The narrow space is maximized by keeping the cooking and storage on the right, and dining on the left. When one wallpaper isn’t enough, use two! 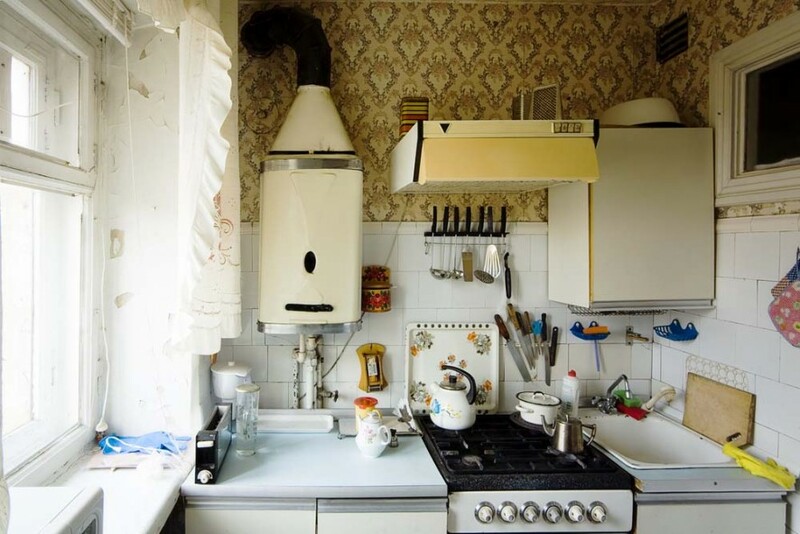 The secret to pulling it off lies on the scale and contrast, as shown in this compact kitchen. 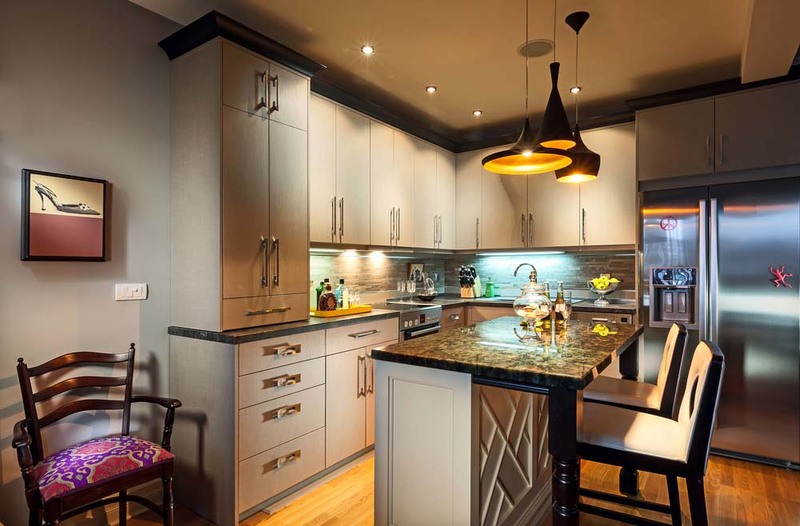 Everything else – the backsplash, custom-built cabinets and granite wine case – is kept elegantly polished in shades of black, gray, white and taupe. 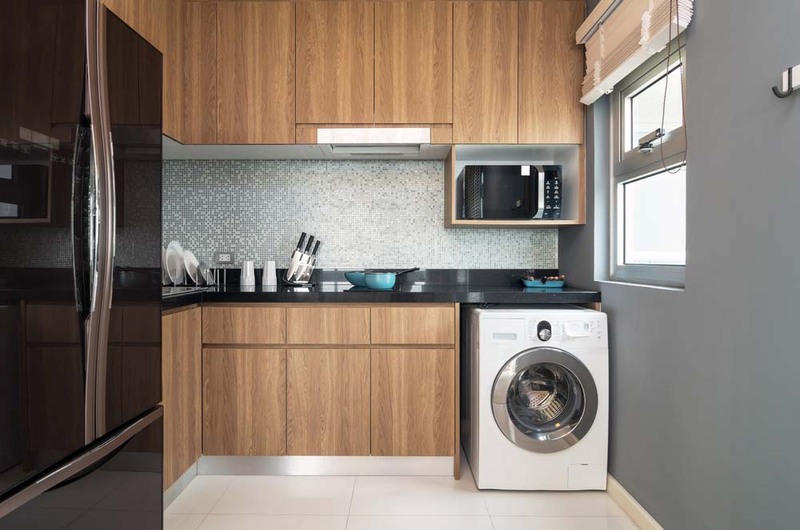 Here’s a practical two-in-one twist: this kitchen is also utilized as a laundry area. This room maximizes its space with tailor-fit cupboards in walnut finish, with glittery backsplash tiling to add a little sparkle. Deep brown floors deliver a dramatic contrast to a beige and white background. The depth created by the subtle change of shadesand the clever arrangement of the appliances help in expanding the space in a strikingly modern way. 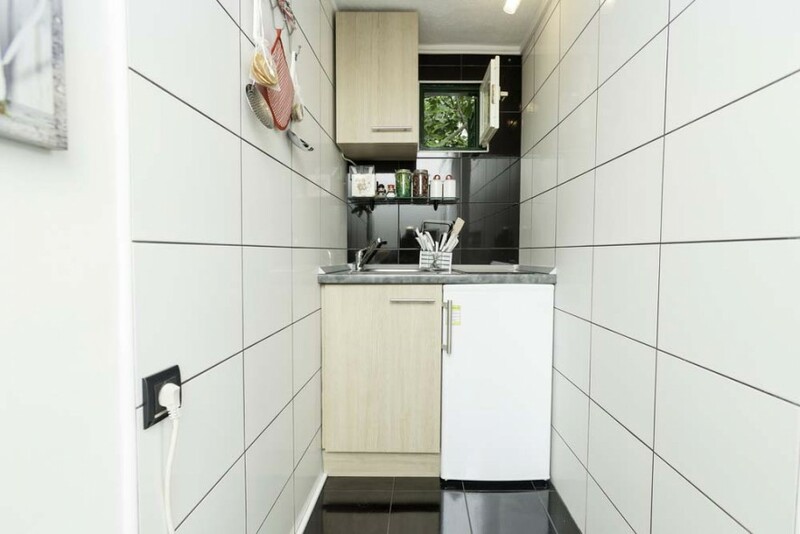 It’s not a wonder that the timeless black and white checkerboard is popular for tiny spaces. The design serves as a stylish distinction from the bedroom next to it. To avoid an over-all busy look, the walls and fixtures are kept plain in crisp white and taupe. Traditional style elements like frilly curtains, florals and Victorian prints can be chic, as shown in this charming little kitchen.  The trick is making sure that there’s a majority of solid color surfaces, in this case, classic white. 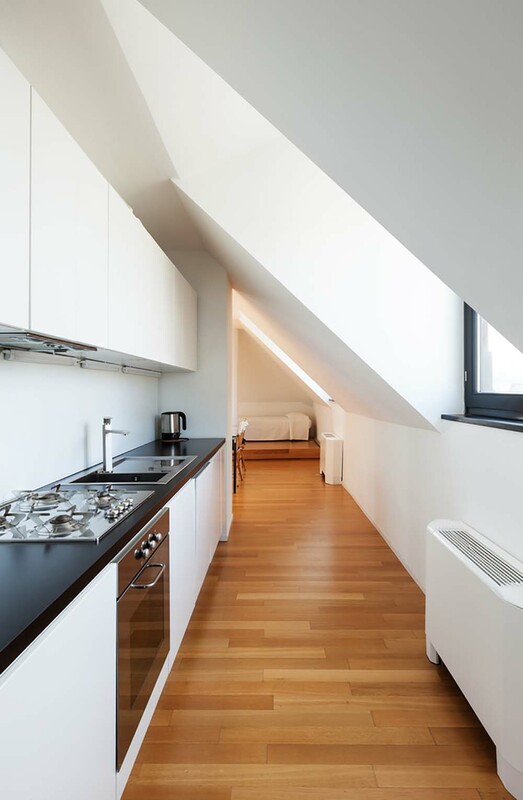 Turn interesting architectural details like this sloped bay-like window with a skylight into the focal point of your small to medium sized kitchen. Minimalistic neutrals highlight the intricate angle, gorgeously illuminated by sunlight. 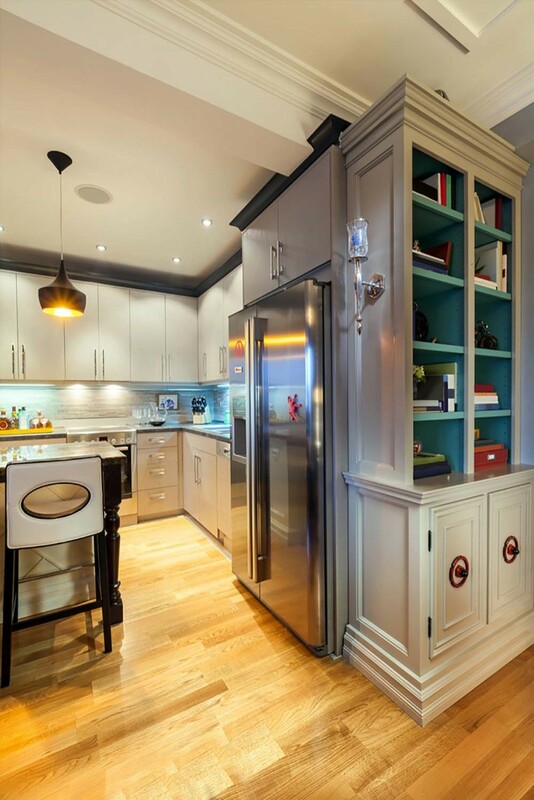 Narrow spaces can be a challenge, and this unique room addresses that by ingeniously fitting cabinetry on all usable sides. The clear glass windows bring the outdoors inside, which make them the real star of this space. The fresh teal tiles comes a close second. A divine white kitchen with lightwood flooring maximizing the space with an eat-in counter extending from the countertop. 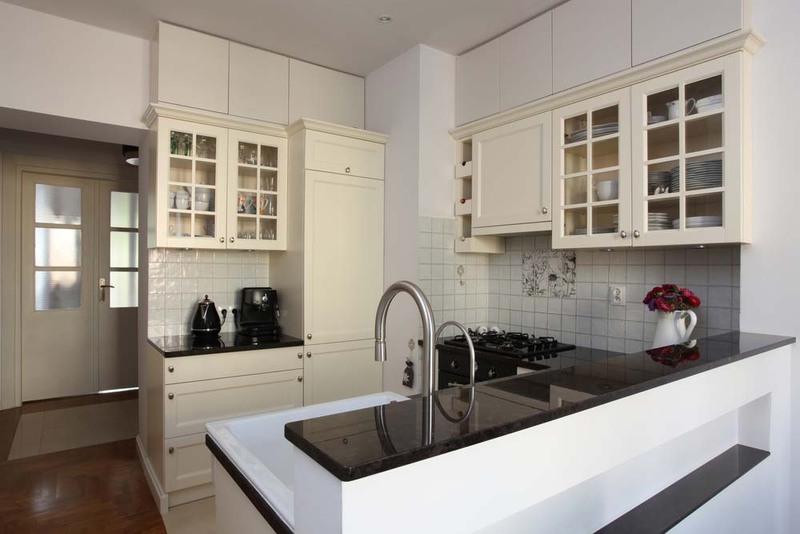 The matte white cabinets against the shiny brick wallgive a brilliant depth to this modern marvel. Another refreshing white kitchen with a cool layout and just-right appliances. The island is a smart addition, which with the right accessories can easily become the focal point of the entire space. The sloped glass ceiling and large glass window serve as a skylight and effectively as the focal feature of this tiny room. 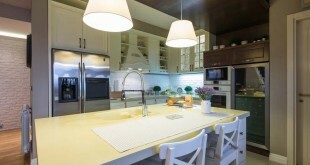 White counter tops top off warm toned wood cabinets. Stainless steel is always a great choice. 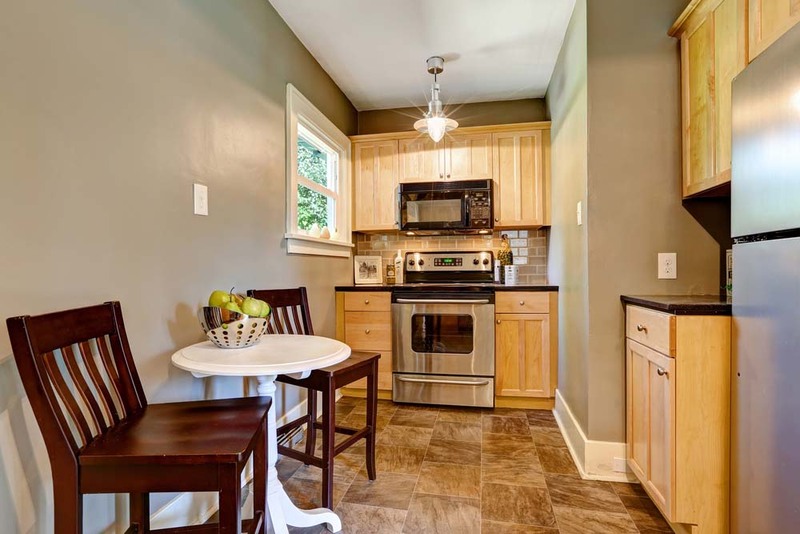 And in this tiny kitchen, it matches with the neat washing machine snuck between cabinets and a fitted cooking range. Bright white and trims of gray complete this minimalist beauty.